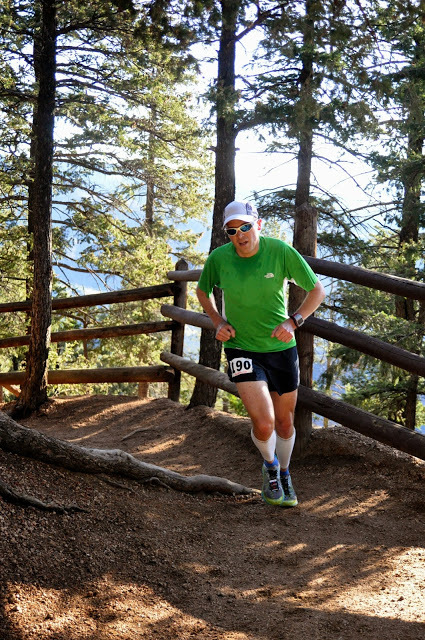 Road Trail Run: Review-HOKA One One Tor Ultra Hi WP. Hiking Boot or Trail Running Shoe? Review-HOKA One One Tor Ultra Hi WP. Hiking Boot or Trail Running Shoe? Hoka has been an innovator and industry leader in the maximal shoe market, creating lightweight shoes with more cushion and comfort than one could have ever imagined previously. When I first saw a pair in 2010, I, like many, laughed, called them clown shoes, etc…, but after receiving a pair of Hoka Mafates a few months later, I was completely sold. Hoka has come a long way since then, with all of their technology, real world use, athlete feedback and testing has culminated with the Hoka Tor Ultra Hi WP. Truly another revolutionary product from a revolutionary company. Is it a hiking boot or a trail running shoe? The Hoka Tor Ultra Hi WP sure looks like a hiking boot in most regards, but does a surprisingly good job doubling as a trail runner for those looking for more performance than could be found in a traditional hiker. Upon first viewing the Tor Ultra Hi WP, it is obviously apparent that it is BIG! Hokas are rather large to begin with, then add an above the ankle supportive collar, full grain leather upper, heavily lugged Vibram outsole, you expect that this shoe would be very heavy. It is by no means a lightweight at an advertised 17 oz. for a men’s size 9 (1 lb, 1 3/8 oz (494 grams) for my size 10), but it definitely felt lighter in the hand than I expected, feels light on the foot and lighter than traditional hiking boots. This shoe is incredibly versatile and performs amazingly well in just about any condition. Here's why. The Upper: The upper of this shoe primarily consists of full grain leather and textile overlays, on top of an eVent full bootie waterproof membrane, that gives the shoe a look/feel of durability and quality. The material is moderately stiff, but in a protective, supportive and welcome sort of way, feeling sturdy without being the least bit confining or restricting. The lacing of this shoe adds significantly to secure fit, with 6 sets of eyelets starting at the toe and then continuing upward with 2 sets of lace hooks on the ankle collar. The tongue is built into the upper as a singular piece to prevent water/moisture from seeping in. Padding of the tongue is moderate and also rides high, in line with the tall collar. At first I was attracted to this shoe because of the tall ankle collar and the added benefits this would provide in deep snow, a nice upgrade/option over many other shoes with just a built in gaiter. I was looking forward to the added ankle protection it would provide, from rocks, logs, crusty snow or any other obstacles you might find when pushing through rough terrain and conditions. My expectation were exceeded in both of these regards, as they did protect my ankles numerous times from scuffs and bumps. Initially, I was somewhat worried that the high collar would be annoying, distracting or even cause chaffing, but these worries were quickly put to rest on the first run. When trying them on in the house, the high collar was a bit noticeable and perhaps somewhat distracting, but I wore these with a mid-shin height, medium/heavy wool sock and completely forgot about the taller cuff when outside running or hiking. With each run, the material softened a bit to become more pliable, while I also became more accustomed to the fit and feel of the shoe over time. Additionally, the Meta-Rocker outsole helps facilitate forward motion with less bending of the ankle, which is helpful for a shoe the has such a high top. I really appreciate the eVent material in this shoe and through my experience with the Tor and other eVent equipped shoes I have worn, I have found the eVent material to have superior waterproofing properties to their competitors, is better ventilated/breathable and maintains those properties for a longer period of time. I was able to test this shoe in snow of various depths and consistencies, from deep fluffy powder to wet slush and my feet stayed warm and dry the entire time. I even aimed for deep puddles when possible, creeks and even submerged the shoes in an ankle deep creek for several minutes and my feet remained completely dry. The temperature range during the test period for the Tor, ranged from as low as the high 20’s to as high as the mid 60’s. My feet were quite warm and comfortable on the lower end of this spectrum, but even on my runs where it was over 60, my feet were a bit warm, but not overly so. Additionally, the Tor has a sturdy reinforced rubber toe bumper that wraps generously around and over the toe, shielding from just about any rock kick or impact. The fit of the Tor is fairly generous. I am a size 10 in most Hokas and I wear a size 10 in the Tor as well, but there is plenty of room to wear a thick wool sock, as the shoe is somewhat voluminous and I have a somewhat low volume foot. If a thinner sock is preferred, then consider sizing down a half size and as always, find a way to try them on with the socks you intend to use, or order from a vendor with a good return/exchange policy. Protection is the continued theme here as well, as this is a Hoka after all and provides a generous 32 mm of cushion in the heel and 28 mm in the forefoot. The EVA and RMAT blended midsole is comfortable and compliant while maintaining excellent support and surprising response. The signature maximal Hoka midsole not only provides excellent cushion for long days on the trail, but provides amazing protection from impact on rocky terrain, as I felt as though I could land on just about any size/shape rock at any speed, at any angle and I never felt a poke or jab. The Vibram Megagrip Outsole has generous lugs, which are well positioned and have a very effective shape/pattern for maximum traction on just about any surface. They grabbed particularly well on steep, loose dirt, snow, packed snow and slush. Beyond the lugs though, the rubber compound is among the stickiest that I have ever used, rivaling the La Sportiva Bushido and North Face Ultra MT, my two favorite go to shoes for wet/dry traction on rock. I could hardly get the shoe to slip in any of the above conditions, if at all. Like other Hokas, to compensate for the high stack height, the outsole is significantly wider than normal shoes (~⅓ more surface area). This added width, combined with the tall collar, make this shoe incredibly stable and confidence inspiring on technical downhills. The late stage Meta-Rocker outsole helps with forward motion and is especially welcome in this shoe because of the heavier leather upper and high collar, it works as nice assist. 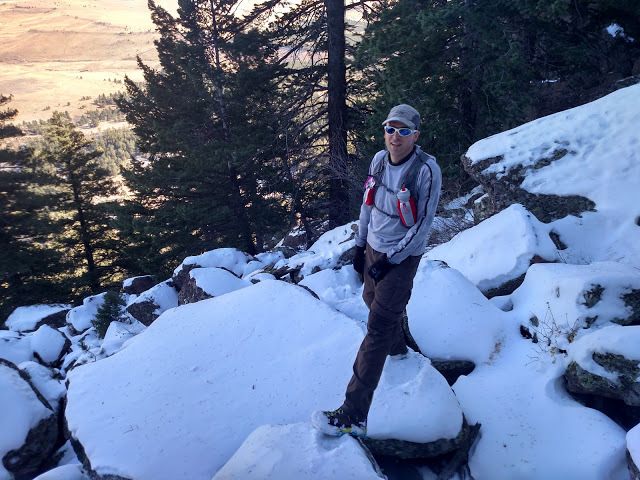 One of the highlights of my testing of the Tor came on an 8 mile loop hike/run of Eldorado Mountain in Boulder, Co., where I got to traverse a wide variety of terrain and conditions. The start of this adventure was uphill/flat dirt road, followed by steepening, snow covered single track. Then the real fun began, scampering, clamboring and scrambling over, through and around snow and ice covered boulders that were anywhere from the size of a kitchen stove, all the way up to the size of an SUV, then steep, snow covered side hilling with slick deadfall, class 4 sandstone scrambling, miles of steep and snowy bushwhacking. On the run out, there was a good bit of snow/ice/slush covered trails, followed by dirt and paved road running. Surfaces could not have been more varied and no one shoe would have been ideal for this sort of outing, but the Tor came about as close as any shoe could come for this type of wild adventure. Traction was amazing at all times, they scrambled well on rock, grabbed well in the snow, the ankle protection and support was welcome in the boulders and through the deadfall. When it came time to run a fast pace once we hit maintained trails and the road, I forgot that I was wearing a shoe that resembles a boot and just felt like I was wearing any other Hoka. The Tor is confidence inspiring at any speed, but shines on technical terrain, facilitated by the grippy Vibram outsole, cushioned and supportive RMAT midsole, secure upper and the added support the high collar gives. For example, on a separate run, I pushed the Tor to paces in the sub 6 range for short periods and they performed quite well all things considered. I would recommend this shoe to a wide variety of groups. For the mountaineer or peak bagger, looking for a warm, waterproof, protective, reasonably light, well cushioned shoe for long days or multi day trips. Any runner who does not want to be slowed by Winter, no matter how cold and snowy it becomes. The ultra/adventure runner out for long days that involve rugged terrain, wet/snowy conditions, where a boot might come in handy, but want a lighter shoe that can also handle long approaches. Snowshoeing, this boot is warm enough and waterproof enough to work very well and the toe is slimmer than many dedicated Winter boots and is more likely to fit into non-expedition, running style snowshoes. Backpacking, trekking, general hiking. With the added cushion, ankle support, lightweight and waterproofing, the Tor would be an excellent choice. At $230 retail, the price of the Hoka Tor Ultra Hi WP is in line, if somewhat on the high side, of other waterproof hiking boots being sold at major outdoor retailers. Given the performance, versatility and uniqueness of the Hoka Tor, I would consider that to be $230 very well spent. -0.15 for high price but you do get what you pay for in this outstanding shoe. 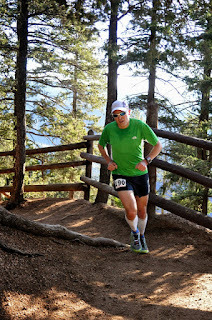 The Tor Ultra was provided at no charge to RoadTrailRun. The opinions herein are entirely our own. Thanks for posting this! I'm looking for a trail running shoe for winter, and your review makes the Tor Ultra sound like it's perfect for the task. An active lifestyle demands high quality footwear to sustain performance. Beyond how you perform, a good active shoe needs to protect your feet as well. From trail running to tennis to hiking, the best athletic shoes embody comfort and versatility to keep you performing at your highest level. I find this website for Best Breathable Work Boots. A really useful review, thanks. I just got myself a pair to help ease back into sport following a nasty foot injury. Having replaced the insole that comes with the them my feet have never been so comfortable! They've greatly accelerated my getting back to being active again, and it blows me away that I can already sense they'll be great for running mountain trails in too. As you say they feel much lighter than their actual weight (I'm used to running in 220g trail slippers, but these Hokas really don't feel that heavy). Here's hoping they last well too.